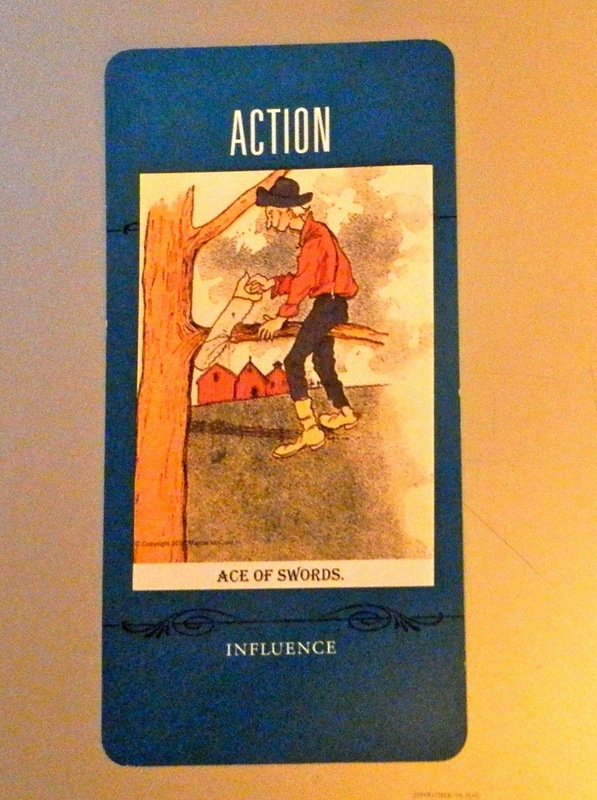 Today's Draw: Ace of Swords from the Postcard Tarot by Marcia McCord in the Action position from the Deck of 1000 Spreads. Is there a situation you'd like to have control over, but don't? Is it possible you're not thinking clearly trying to assume control of the situation? Might you be better off not doing anything and just leaving the situation up the way the cookie crumbles? As I was choosing today's card, I was thinking about a couple of situations I desperately want to have control over, but really don't. One is that pretty much all of my checks are arriving late this month, probably because of the holiday last week. I'd expect to receive checks today at the very latest, but since my mailman doesn't deliver the mail until around 9pm, I won't know until the end of the day. And because I have a meeting tomorrow morning, it would be nice to swing by the bank on the way to the meeting and know that my bills will be covered this month. But since I don't know if I'll have checks to deposit, I don't know if I should leave time for that in some already pretty tight plans. I have no control over my clients. I have no control over the mailman (can you BELIEVE they deliver that late???). And, because they deliver that late, any checks sent to me have to wait until the next day to make it to the bank. All of this is causing stress because, you know, there are bills to pay. And while I have earned plenty enough to pay all those bills, they're getting paid late because I'm getting paid late and it's not making me a happy camper. So I get this Action card from the Deck of 1000 Spreads and think, "ok. This is going to tell me how to solve all of this." And the Ace of Swords is usually about cutting through confusion, mental clarity, breakthroughs and news ideas. But the picture on this particular one belies all of that. The dude's going to cut the branch, then go tumbling to his death! So I think this is telling me that I just have to live with this tension for a while longer...and not call my clients and scream at them in this state...haha. It's all a control issue. And, unfortunately, I planned all my checks to arrive around a holiday this month. So it's also all my fault. Basically, I've done all I can do in this situation. All that's left is to sit and wait. When you live alone and work for yourself, you're often able to have a lot of control over how your day goes. Some days the phone rings off the hook or emergency work flows into your in box, but most of the time you at least have the illusion of control over your schedule and your life. And this month is bringing me so many variables that put me outside of that comfort zone. It's more than just checks. It's like the litany of all my anxieties is raining down upon me...haha. Normally the Ace of Swords would tell me to put mind over matter and that an answer is coming. And all of that is true. But this particular one is basically telling me that all of this "stuff" is going to resolve itself sooner or later. I've already done my part. And any further effort will just send me tumbling off a high limb. In a way, I guess, the clarity this card promises lies in staying in the dark a little while longer. You can't always have the answers. Sometimes you have to be more patient than you want to be. And sometimes trying to assume control just to take action can work against you.